This year’s Paralympics came to a close this past Sunday, and it drew the largest ever television audience – except in the United States. In the U.S., coverage had been minimal, mostly occurring following the close of the event. If I recall correctly, NBC coverage of the Olympics extended for three weeks, while this year’s Paralympics coverage will last only 5.5 hours. Why should that matter? I believe that the Paralympics can help shift attitudes toward people with disabilities. It’s time to recognize that Paralympic athletes are elite athletes who have overcome challenges that many would consider insurmountable. They serve as role models for thousands of children who face physical and intellectual challenges. Children can now dream of winning like swimmer Victoria Arlen of the United States who won Gold in the 100m Freestyle event. If you believe as I do – that individuals with disabilities deserve every opportunity to reach their fullest potential, I encourage you to sign an online petition to persuade U.S. TV networks to broadcast live future Paralympics. 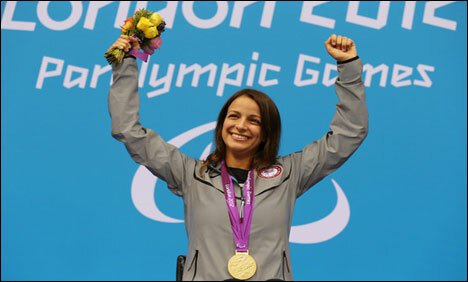 This entry was posted in Uncategorized and tagged disabilities, nbc, paralympics, victoria arlen. Bookmark the permalink.